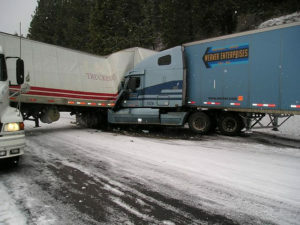 Victims of tractor-trailer accidents face an increased risk of suffering a serious injury or death. Trucks can weigh up to 80,000 pounds and the force and momentum of a collision with a tractor trailer or semi-truck can be devastating. Brown Moore & Associates, PLLC has extensive experience providing representation to truck accident victims after they get hurt or a loved one has been killed in a semi-truck collision. With decades of collective experience, members of our legal team have helped clients to recover millions in damages. We can help you seek the compensation you deserve after your truck accident case so call now to schedule your free consultation with a Charlotte tractor trailer accident lawyer: 844-452-3688. If a tractor trailer accident leaves you with injuries you have the right to be fully and fairly compensated for all financial and non-economic losses, if you can prove someone else was to blame for the accident. In deadly truck collisions, family members of victims also have the right to wrongful death damages if they can make their claim. Securing compensation involves showing negligence occurred or a legal duty was breached. Demonstrating a violation of Federal Motor Carrier Safety Regulations (FMCSRs), which apply to commercial drivers, can create a presumption the driver was negligent. A trucking company or driver that failed to incorporate safety practices or safety features that are considered industry best-practices could also be considered negligent. A negligent trucker can be personally responsible for the losses a tractor-trailer accident causes. In addition his or her employer can be liable. Trucking companies are vicariously liable for negligence of on-duty employees under agency rules, which means a trucking company can be sued if a driver violated FMCSRs, state driving laws, or was unreasonably careless. Trucking companies are required by federal regulations to have $750,000 minimum in liability coverage. If the truck involved in the collision was transporting hazardous or toxic material, minimum liability coverage limits may be as high as $5 million. Trucking companies have to carry large amounts of insurance to make sure there is enough money available to help victims who get badly hurt. The injuries sustained in a truck crash or an untimely death can lead to huge medical expenses, and a lifetime reduction in earning power if work abilities are affected by permanent injuries. The Charlotte semi-truck accident lawyers at Brown Moore & Associates, PLLC can help victims and their families to pursue an out-of-court negotiated settlement to seek compensation for truck crashes or can provide assertive legal advocacy during court litigation so victims can make a strong case to convince a jury to fully compensate them for damages. Don’t hesitate to get the help you need after a truck accident – you want to make sure you do everything you can to make a successful claim so you can get the best medical care and not face financial worries. Call toll-free today, 844-452-3688, to schedule your free consultation with a tractor trailer accident lawyer in Charlotte. Brown Moore & Associates, PLLC serves clients in Charlotte as well as in surrounding areas throughout North Carolina.